The Conference of Peripheral Maritime Regions (CPMR) has expressed its hope that the people of the UK will vote to remain in the EU in the interests of unity, joint cooperation and global economic prosperity. 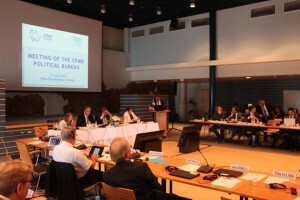 Speaking at the CPMR Political Bureau in Kymenlaakso, Finland, on behalf of 160 Member Regions from throughout Europe, CPMR President, Vasco Cordeiro, said: “The CPMR Political Bureau supports the democratic right of the UK people to consider their future in the European Union. We are confident that Europe will be stronger with the UK as a member and that UK will have also a stronger presence and voice within the European Union and not outside. The CPMR Political Bureau wishes to extend their deepest condolences to the family of the UK MP Jo Cox, who was tragically murdered on 16 June.